Hanakago is a reflection of Japanese creativity and talent in turning basketry into an art form that became an integral part of their cultural heritage. Hanakago is not about creating ordinary baskets. It is more like creating sculptural pieces, showing the weaver’s control over its medium. Bamboo is known for being straight, coarse and stiff, yet in the hands of a master weaver, it could be shaped into something undulating and curvaceous, which challenges conventional basketry. Hanakago makers also carefully choose other natural materials in different colors and design to create a wonderful interplay and union of materials, to come up with something truly magnificent, complex and creative. 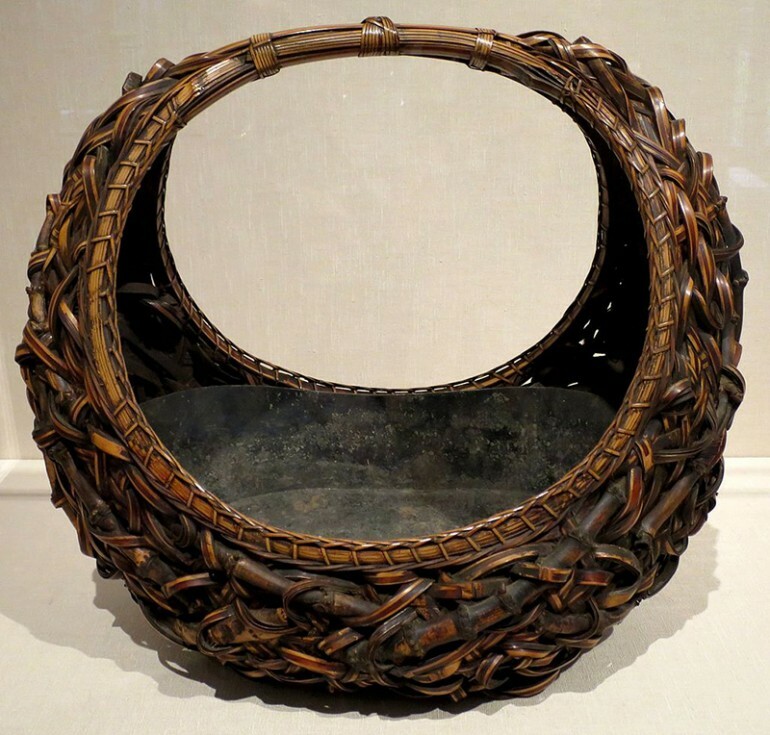 Japan has some of the most beautiful baskets in history, where bamboo plaiting, as a craft, started around 10,000 – 300 BC, which was the Jômon period, where utilitarian basket were created as a common receptacle. Throughout the country, hundreds of bamboo varieties grow, many of which are still used in house and furniture construction and well as in medicinal and culinary preparations. The bamboo variety that was very suitable for basket weaving is “madake,” a large-diameter bamboo characterized by very straight grain that makes it easy for the material to be split into finer strands. Hanakago started to make an appearance in Japan as an essential tool for flower arrangements and tea ceremonies during the Muromachi Period, which was from the late 14th century to the 15th century. From being a craft, hanakago became an art form in the middle of the 20th century, although it was more of a Western distinction. China had been culturally excellent for centuries among East Asian countries, and Japan recognized that, and was in fact a beneficiary of that cultural excellence, as the country borrowed China’s religion and several art forms, including basketry, lacquer, ceramics, bronzes and paintings. Chanoyu or the ritual tea ceremony of Japan became an organized social meeting for aristocrats, high-ranking warriors and monks in the 16th century. Focus was given on the etiquette and aesthetics in the preparation, serving and drinking of matcha, the Japanese powdered green tea. 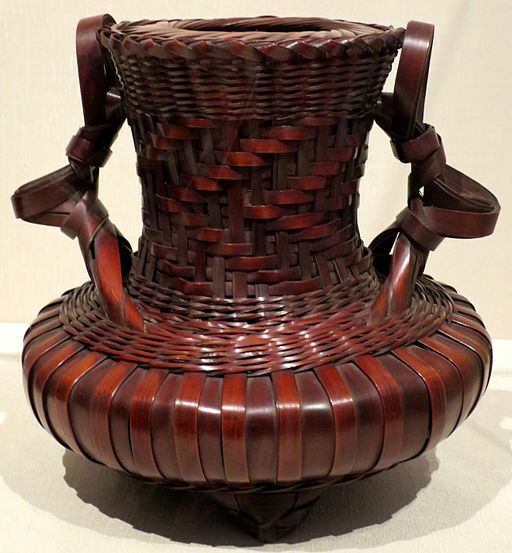 Chanoyu was closely associated with flower arranging and became a secular art form, which started the use of baskets. With the popularity of the tea ceremony in Japan during the Edo Period in the early 17th century, the demand for baskets grew as Ikebana became an essential part of the entire tea ceremony. In the Kansai region, a group of artists veered away from the Chinese influence in the 19th century and started to look into a more artistic approach to art, with some influence from the West. They started challenging the principal material, bamboo, in ways that were unheard of. They explored the lines of negative and positive space as well as crevices while still being reminded that bamboo is their primary material to give the baskets their form. Chinese baskets always show symmetry and balance whereas Japanese aesthetic follows the “wabi-sabi” philosophy, which is the acceptance of imperfection and transcience. Japanese artists put higher value on the effects of nature and visual irregularity, as exemplified by the irregular shape of a tea bowl and a Bonsai tree’s twisted branches. Bamboo basketry, which is a 600-year Japanese craft, remains a miniscule art form because it takes an artist decades to learn it. Moreover, the various processes involved in the creation of a basket is done by one person, as division of labor is not possible, for it requires the sensitivity, individuality and the creativity of the creator in every step of the process. The artist has to feel each and every bamboo strip and know exactly what type of basket it will become. How the bamboo is treated is also a trade secret and there are various ways to treat bamboo, including boiling it, to make it stable under climate changes and other stresses. Iizuka Shokansai is the son of the most famous bamboo artist in the 20th century. He studied oil painting at Tokyo University but had to learn basketry under his father when they lost his brother in the war. In 1982 the Agency for Cultural Affairs and the Japan Crafts Art Association named him a Living National Treasure. Today, there are fewer than 100 bamboo artists in Japan and most of them are in their 50s and 60s. Many of the Japanese bamboo artists of today are informally or formally associated with the few artistic lineages practicing the art form, which are primarily based in Kyushu, Eastern Japan and in Western Japan.